The What: QSC will expand its amplifier solution with the introduction of new SPA Series amplifiers. 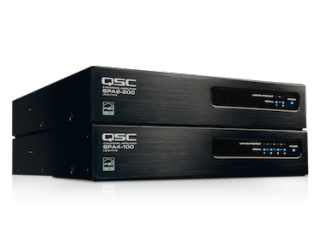 The What Else: QSC is introducing two new models to the SPA Series amplifiers, suited for use in corporate AV applications. The SPA2-200 and SPA4-100 offer 2x200W or 4x100W per channel into eight ohm and four ohm outputs, with the ability to bridge channels for 70V and 100V capability. These amplifiers are ENERGY STAR compliant. These half-rack size amplifiers offer a flexible mounting system for multiple options, such as under the table, wall-mounted behind a display, or side-by-side in a credenza rack. They have an aesthetic design that easily blends into a corporate environment, and they include remote control capabilities for applications such as fire and safety paging. The Bottom Line: New SPA Series amplifiers will debut at the 2016 InfoComm Show from June 8-10, 2016. QSC will be featuring many new solutions at this year’s InfoComm show at Booth #C10507 and Demo Room N101.